Sunlight in the bedroom, and some new books. Indeed - I always buy them in tight bud. That is a good description of their scent. I am thrilled to hear that 66 Square Feet is all checked out! Thank you for letting me know. Daffodils always make me smile. Sitting in the sun they seem to be saying "See spring IS coming!" 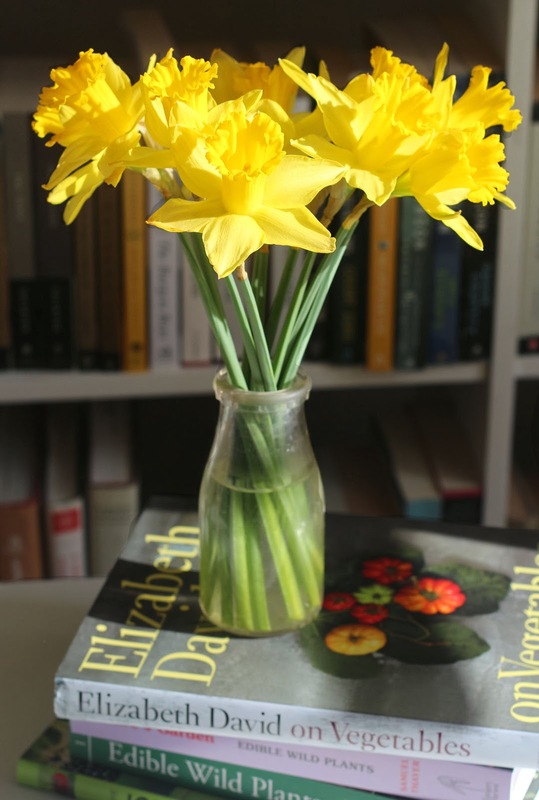 How coincidental - I have daffs in a similar vase on my desk as well, and I love how their powdery, fresh lily fragrance fills the room :) In a few days the parks in my neighbourhood will positively trumpet when the daffs bloom - can't wait! Ooh! You'v e got the Elizabeth David vegetable book.One of the best. It does not surprise me, Marie, that daffodils also make you feel better. Some of my favorite daffodils come from a small clump rescued from a house being bulldozed for a parking lot; I've always hoped that somehow, someway, the person who planted those daffodils in what is now asphalt knows that they flourish by the hundreds here.